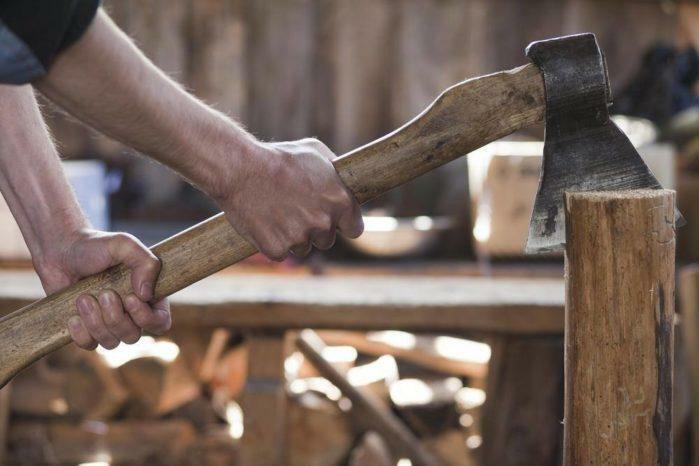 The haft or the handle of the ax is undoubtedly a vital component. Many woodworkers will not start their work if they haven't checked the condition of the handle. If they can notice some damage or deterioration on this part, they would immediately replace it. But how to replace an ax handle? If you are a serious woodworker, you won't trust this errand to anyone. As much as possible, you will hand this job to professional repairers. But didn't you know that with enough tools and skills, you can interchange the handle of the ax by yourself? If you don't want to waste time, I recommend that you should do this maintenance procedure on your own. Don't worry. I have laid out the instructions correctly in the following section so that you can get started already. Well, the key to the success of this operation is acquiring a quality replacement. Even if you can change the handle of the ax, if the former is still flimsy and brittle, nothing will change. The handle will always bound to crack or split, especially if you are making some heavy-duty applications. 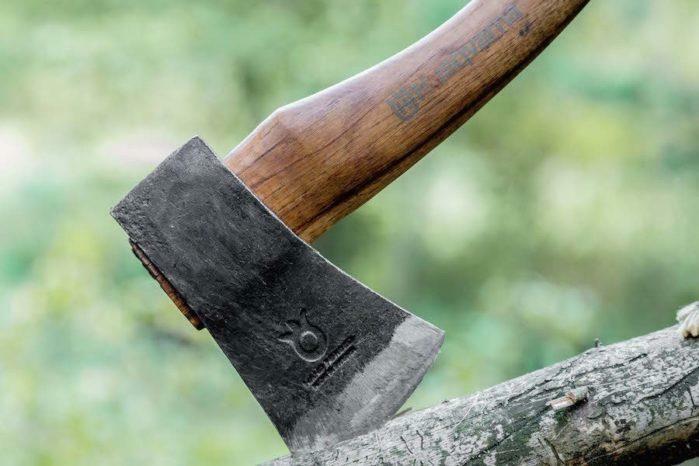 So what should you look for an ax handle? For me, I would recommend that you should get a haft that comes out of a well-seasoned wood. Its grain should be erect and straight. Take note that wild grains are susceptible to breakages. For wood choice, I think getting hickory or ash woods are the best option that you have. Some people may point out white oak, and that is okay. The latter is usually suitable for Japanese type of axes. You can also construct your handle, but I think it requires sufficient experience and craftsmanship. Also, let me emphasize that the handle should be dry. Even if you purchased the tip is dull, you should still make it barer. Storing it in a heated room would be a good idea. On my part, I usually expose the handle on a radiator. But why do you need to make it dry? The answer is simple. The handle tends to stick with the ax if there is no moisture on its surface and interiors. 1. The first part begins by removing the current handle of the ax. You need to use the saw so that you can sever the tip near the part where it meets with the head. Next, have the head be soaked in the bucket of water overnight. The next day should be for drying the head. 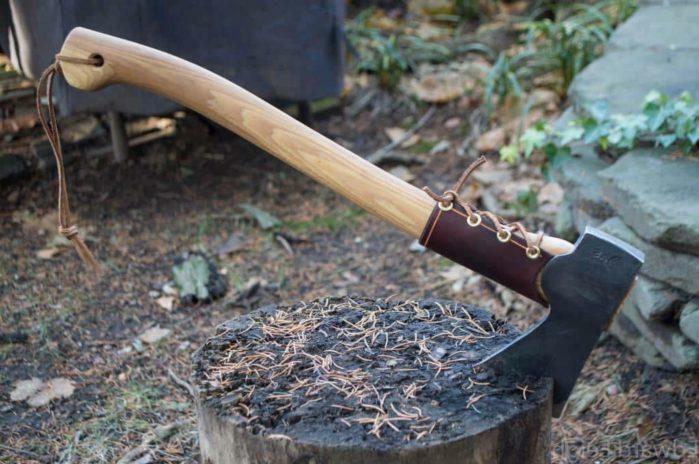 Then, the remaining part of the handle in the ax would be dry already. But it is looser than it used to be. 2. Take the vise and clamp the head of the ax onto it. If you can spot some wedges on the upper portion of the handle, take them out with the use of the cold chisel and hammer. Clamp the vise open so that you can turn the head of the ax upside down. Use the steel rod with the most significant diameter (1/2 inch) and use it to tap the handle out of the ax. Just touch with the use of a moderate force. There is no use in driving the rod like crazy. Moreover, you should tap different parts of the handle, too. In this way, the latter would become ejected out fully. If there are some remnants, use the steel rod with a smaller diameter to take them out. 3. Maintain the position of the ax head on the vise. This time, take the replacement handle that you bought and try fitting it to the head. Don't be happy if the handle installs quickly, as it means that it is too loose for the ax head. The dimensions of the handle should be more significant than the socket of the shaft. In this way, you can fit the handle tightly and securely. Once you can get a snugly fit, you can already shave the lower parts of the handle. That is the finishing touch that you should do to ensure that the grip won't slip out from the head. 5. But wait. The process is still not over. You still need to insert the wooden wedges on the head. To do this, you need to remove the excess parts of the handle that is near the steel. Next, have the edge of the wedge inlined on the saw kerf. After this, tap that part moderately with the use of a hammer. Drive the wooden wedge thoroughly. If there are still some parts that are sticking out, just remove them off. 6. The last step that you should do is pounding a steel wedge in the middle of the head of the handle. Doing this would split the wooden wedge that you have inserted. But that is okay. Use the cold chisel to punch the steel wedge and bury it slightly on the upper portion of the handle. Learning how to replace an ax handle is not a straightforward task. It requires patience and precision on your part. But if you can practice with this, you can certainly get the hang of it sooner or later. Just make sure that you have an excellent replacement to ensure its longevity and durability. Also, having the tools that I have listed here can smoothen the process. Did you learn from this article? If you have any questions or suggestions, just feel free to ask me in the comment section below!